Elected by the General Assembly on January 16, 1920, to fill the vacancy created by the resignation of Kennon Caithness Whittle and began his service on March 9, 1920. Service terminated by death. Elected, Journal of the Senate of Virginia, 1920 Session, 35; chosen by Democratic caucus, Caucus Selects Saunders for Supreme Bench, Richmond Times-Dispatch (Richmond, Va.), January 16, 1920, retrieved on March 26, 2014; took his seat March 9, 1920, 126 Va., iii; died, 132 Va., iii; birth, death, education, and career, Saunders, Edward Watts (1860-1921), Biographical Directory of the United States Congress, retrieved on March 26, 2014; attended law school, University of Virginia Law Catalogue, 1882-1882; and transcript of portrait presentation on January 16, 1931, published in 155 Va., v-xi; portrait, Ray O. Hummel, Jr., and Katherine M. Smith, Portraits and Statuary of Virginians Owned by the Virginia State Library, the Medical College of Virginia, the Virginia Museum of Fine Arts, and Other State Agencies (Richmond, Va.: The Virginia State Library, 1977), 108. In 1929, the Virginia State Bar Association formed a committee to acquire portraits of former justices who were not already represented in the court’s collection and approved a measure to reduce the cost of the project by asking family members of the justice to donate a portrait. 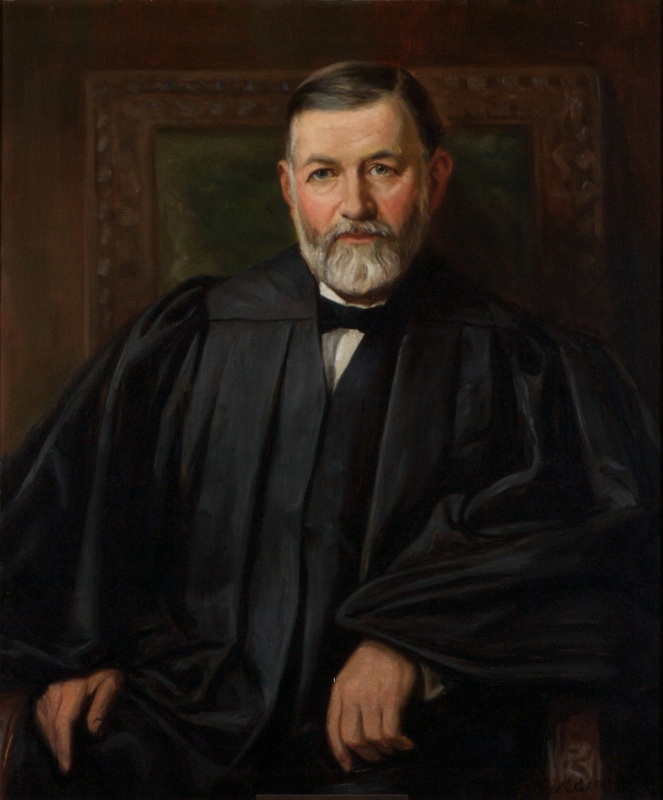 Saunders’ portrait was donated by family members in 1930 in response to this request; see Proceedings of the Fortieth Annual Meeting of the Virginia State Bar Association, August 1929, 206-210; and Proceedings…August 1931, 103.